Given how late he arrived this past summer, many would argue that Maurizio Sarri has made a positive start to life at Chelsea. The Italian tactician wasn’t given a great deal of time to settle, while he was only able to bring in three new signings to stamp his mark on the squad. With that in mind, the fact that Chelsea are in the top four in the Premier League and are going along well in the Europa League and League Cup, should be reasons to praise the former Napoli boss. However, Corriere dello Sport have uncovered a worrying statistic, as they’ve compared Sarri’s points tally so far with that of Antonio Conte’s from last season, with the former Blues coach getting the sack at the end of the campaign for what was seen as a disappointing year. 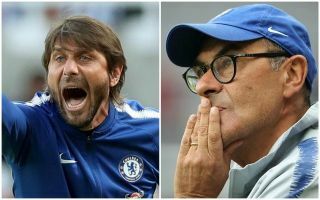 Despite his struggles last season, Conte had one more point than Sarri’s 30-point tally at this same stage, and it’s added that he had already faced several of the ‘big clubs’ while Sarri prepares to face Pep Guardiola this weekend. In turn, that could raise question marks over whether or not Chelsea are making progress after their decision to change coach, but ultimately it still seems unfair to judge Sarri on the first half of this season alone given the circumstances. With a season under his belt to gain experience of managing in England, coupled with two more transfer windows to continue to strengthen the squad and mould it into his own, perhaps Chelsea fans won’t see the best results from him until next season at the earliest. Nevertheless, for all the positive signs that they’ve showed so far this year, the points tally being lower than that accumulated by Conte at this same stage last season will potentially be a reason for concern given how he was under so much pressure for most of the campaign.